So yes. To give it to you simply, before going into all that explanation stuff, it’s very simple – loading more dissolved oxygen into alcohol apparently removes some of the side-effects of drinking it. But more on those details later. Firstly, a brief lesson in how the body processes alcohol. Metabolically, that is, not in the sense of ‘it makes you do silly things and lose control over your joints’. So…Shortly after the imbibing thereof, alcohol gets almost completely absorbed into your bloodstream. By shortly, I mean that about 30-90 min after you’ve had that drink, its goodness has peaked in your blood. And then needs to be got rid of. It is, after all, a toxin. In order to do this, a few different enzymes are needed (see diagram below). 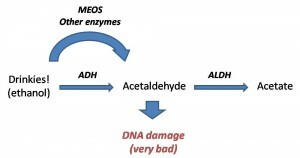 They include ADH (alcohol dehydrogenase), ALDH (aldehyde dehydrogenase) and MEOS (microsomal ethanol oxidising system). To summarise, they are involved in oxidation of alcohol and the ensuing compounds – this whole process is the primary one used to detoxify alcohol, though not the only one. 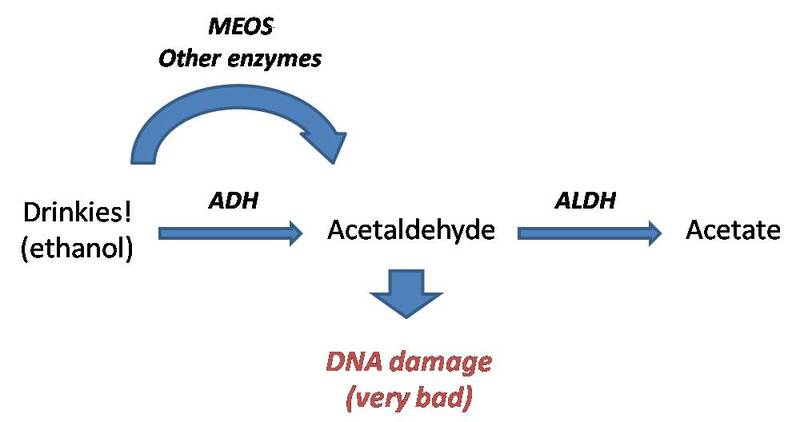 Particularly scary, the intermediate phase of the breakdown process, acetaldehyde, causes DNA damage***. Not, as I’m sure you agree, a good thing. But moving along. As you may have guess from the liberal use of words beginning with ‘ox-‘, oxygen is of primary importance in this process. And, in fact, the more oxygen there is around, the faster the process is able to happen. Also, it would appear to produce ‘major elevations’ in enzymes which are involved in protecting against alcoholic liver damage. Another good thing (my, but aren’t we racking them up). On to the experiment. In essence, they fed alcoholic beverages (with the prior, written consent of their subjects, although why this would be necessary I don’t know. Free drinks!) containing different amounts of dissolved oxygen to their test subjects. Slash new best friends. And they noticed that it took significantly less time for the BAC (blood alcohol concentration) to drop in people fed higher-oxygen drinks. Further, looking at the detailed results (available in the paper), it would appear that this oxygen affects the bits where the alcohol is metabolised/eliminated, not absorbed. Well, it means that you can still get happily tipsy and/or drunk. But, and this is wonderful, you’ll sober up faster, which is good news for traffic- and other drinking-related accidents. Also, hopefully it might mean that less DNA damage takes place. On a separate, but linked note: DNA damage is not, it would seem, permanent nor even particularly difficult to fix (in some cases, at least). We all sustain and accrue DNA damage as we go through our lives, and this damage is of course implicated in ageing and age-related diseases. But a field of study called nutrigenomics looks at how our diets interact with our genotypes at that level. And some of the work done (for example by Dr Michael Fenech) is suggesting that simply feeding our bodies the correct micronutrients can go a long way towards fixing this damage. Of course it’s different for each individual, before you all go charging off to buy millions of supplements. ** Diagram, and knowledge of DNA damage, happily from Dr Michael Fenech (with diagram doubly referenced as Boffetta and Hashibe Lancet 2006 and Morimoto et al 1993). Does this mean that the people that super-oxygenate drinking water and sell it as a panacea actually have something going for them? Nah, somehow I doubt it. The only reason superoxygenating alcohol is useful is that it speeds up the oxidation process – I can’t imagine what superoxygenated water would help with (unless you were drinking that while drinking alcohol, which is unlikely I should think). In drinking contests in Northern China I was knocking back water between toasts of moltai as fast as I could manage. Didn’t help that I had to drink toasts 3 times as fast as anyone else. Aha! The Blood/Breath/Urine Alcohol Calculation expert in me foresees problems (and therefore potential defences) in the criminal (and insurance) case sector if oxygen-enriched drinks are marketed by alcohol manufacturers….. not only in the usual drink-drive cases but also assaults and such like where alcohol is a factor and particularly where forward- and back-calculations are undertaken to estimate blood/breath/urine alcohol concentrations at different times in a series of events, these being the calculations that factor in elimination rates based on published ranges (in NZ, alcohol is a factor in a quarter of all traffic offences, a third of violence (including domestic) cases and half of all serious violence cases). Sure, but that’s not really the point. 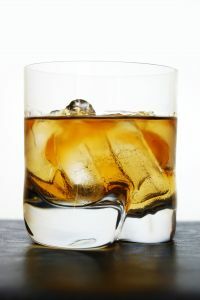 Many people like the taste (and early effects) of alcohol. In the same way, abstinence is the best way to avoid getting STDs, but it’s hardly a viable strategy to promote! Similarly, it’s easier to overcome the effects of death if you don’t die in the first place.